When the music of the predominantly Black New York avant-garde of the 1960s and the Chicago of the Association of Advancement of Creative Music it was as if a strongly worded – and often “sung” – message was being delivered and it was this: “We do not and will not accept the status quo…” Clearly, however, there was a great deal of anger there. 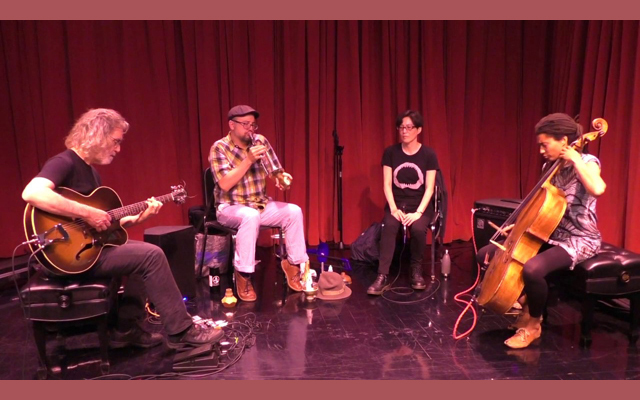 Since then, improvised music has become much more culturally integrated and The Blues and Jazz – always open to change – has developed much further with the influence of conceptual thinking being influenced more strongly by Europeans (and some Americans) from Arnold Schönberg, Anton Webern, Alban Berg to Igor Stravinsky and Karlheinz Stockhausen, Harrison Birtwistle, György Ligeti, John Cage and Gérard Grisey. 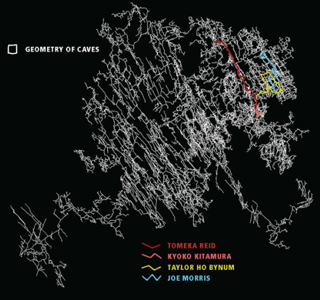 In this powerful music by Tomeka Reid, Kyoko Kitamura, Taylor Ho Bynum and, of course, Joe Morris on Geometry of Caves not only does a brave idiom emerge but it is one that suggests idioms and stylistic metaphors have more to do with universal events and emotions than with anything “closer to home”, so to speak. The suggestion is that while the anger and existential angst is clear and present its power is infinitely more far-reaching; achieving something like the kind of impact Picasso’s iconic painting Guernica might be considered as having on the world quiet beyond painting. For instance, in Geometry of Caves, while the title suggests a kind of dry, scientific spelunking, individual songs go far beyond that and it would almost appear that conceptually and musically the “cave” might even be seen as a metaphor for a subterranean safe haven for humankind. The manner in which a song such as “Prelude to a Crazy Year” unfolds in the multi-phonic screams of Kyoko Kitamura calls to mind not only Munch’s frozen image of The Scream but the powerful feeling of pain expressed in the kinetic energy that flows from the lines of Guernica. The music continues, bouncing from images and emotions relating to the ecstasy of discovery, to fear and hope, joy and despair; from subterranean echoes of the wail of Taylor Ho Bynum’s piccolo and the lonesome grinding of Tomeka Reid’s cello to the guttural screams of Joe Morris’ guitar. In all of this the keening and remarkable bellowing of Miss Kitamura’s voice is the musical highlight – from fearful wail of “Prelude to a Crazy Year” to the sanctified whispers of “Stalactites Chapel”. In her high-sprung articulation and spry syllabic glissandos and other frightening, poignant and always remarkable vocalastics Miss Kitamura gives voice to visceral human emotions like one has not ever heard before. But then it is all in the idiomatic genius of this music and for that we have all of the musicians present to thank…and to heap praise upon them.